My 50th year of investing experience helped subscribers in our Purposeful investing Course (Pi) recently earned 98.68% profit in eight months. Last November 2015, silver had dropped to a special low price. The gold-silver spread had reached a historic high. 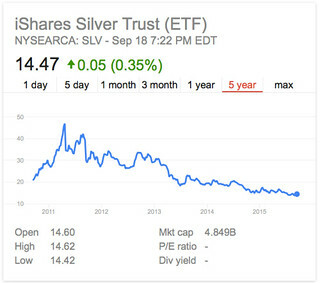 The iShares Silver Trust ETF ( symbol “SLV”) was priced at US$13.60 per share. The British pound parity was US$1.54 US dollars per share. We issued a special report (Silver Dip 2015) to Pi subscribers showing how a 30 year cycle and the risk reward ratio had tipped towards using a British pound margin account to invest in “SLV”. Here is what happened to an investment of US$10,000 with an additional margin loan of 6,500 pounds. The 6,500 pounds were converted to US$10,000. The total $20,000 was invested in SLV at US$13.60. 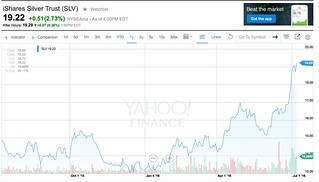 This purchased 1,470 shares of the “SLV” ETF. 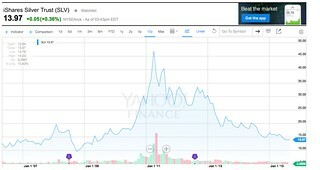 Eight months later, due in part to Brexit, “SLV” shares reached $19.22. Those shares were worth US$28,253. Paying off the 6,500 pound loan cost only US$8,325 because the pound has crashed to $1.29. After the loan payoff, the balance is US$19,868. The profit in eight months is $9,868 or 98.68% of the original $10,000 invested. 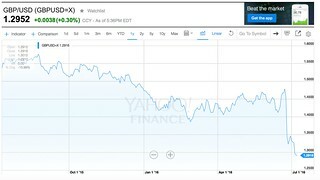 Here is the chart at www.finance.yahoo.com showing the horrendous drop in the pound as it plunged to 1.29 dollars per pound. The chart below shows the price of the silver ETF SLV (recommended in the Silver Dip Report) which spiked up to US$19.22. There has been such great profit potential in the Silver Dip I updated the report in the “Silver Dip 2016” report. I have been writing and speaking about international investments for five decades so this is not the first time Pi subscribers made profits off leverage. Earlier, subscribers received a report entitled “Multi Currency Sandwich” that showed how shorting the Japanese yen and investing the loan in dollars and euro could also bring a fast profit with minimal risk. What a ride! The dollar appreciated over 12% versus the yen in just three months. The Dow Jones Industrial average rose 9.5% in the same period. Those who borrowed yen and invested in the Dow Jones industrial average earned both the 9.5% and 12% profit or 21.5% in three months. Earlier, we helped readers earn up to 266.3% in one year using Swiss franc and yen margin loans. Then we recommended getting out of all the shares and investing in Danish & Swedish bonds before the 2007 to 2009 global stock market crash. These successes are the tip of the iceberg as my 50 year history shows. Yet our Purposeful investing Course (Pi) is NOT about fast moving, speculative stock and currency trading. Pi is about slow, worry free, good value investing from finding good value. Our purpose is to invest for profit, not pride. This means there are only three reasons why we should invest. We invest for income. We invest to resell our investments for more than we had invested. We should invest to make the world a better place. We should not invest for fun, excitement or to get rich quick. This is why the core Pi model portfolio (that forms the bulk of my own portfolio) consists of 19 shares and this position has not changed in over two years. During these two years we have been steadily accumulating the same 19 shares and have not traded once. This good value portfolio is based entirely on good value financial information and math. 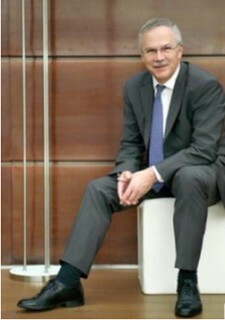 The Pifolio is a theoretical portfolio of MSCI Country Benchmark Index ETFs that cover all the good value markets developed using my 50 years of investing experience and study of the mathematical market analysis of Michael Keppler and his company, Asset Management. The Pifolio consists of iShares ETFs that invested in each of the MSCI indicies of these BUY markets. The Pifolio is the main portfolio we study in our Purposeful investing Course. Then we add spice with leveraged speculations that offer additional profit potential often using leverage. The two conditions are in place again! There are currently the ten good value non US developed markets and none good value emerging markets mentioned above. Pi shows how to easily create a diversified, worry free portfolio that includes each or all of these countries with Country Index ETFs. The current strength of the US dollar is a second remarkable similarity to 30 years ago. Three decades past, in 1985 the dollar rose along with Wall Street. Profits came quickly over three years. Then in 1988 the dollar dropped like a stone, by 51% in just two years. A repeat of this pattern is growing and could create up to 50% extra profit if we start using strong dollars to accumulate good value stock market ETFs in other currencies. This is the most exciting opportunity I have seen since we started sending our reports on international investing ideas more than three decades ago. There is so much more to write and the trends are so clear that I have created a short, but powerful report “Three Currency Patterns For 50% Profits or More.” This report shows how to earn an extra 50% from currency shifts with even small investments. I kept the report short and simple, but included links to 153 pages of Keppler Asset Stock Market and Asset Allocation Analysis so you can keep this as simple or as complex as you desire. The report shows 20 good value investments and a really powerful tactic that allows you to accumulate these bargains now in large or even very small amounts (less than $5,000). There is extra profit potential of at least 50% so the report is worth a lot. Research shows that most people worry about having enough money if they live long enough. This powerful profit wave can eliminate that concern. My experience of the 17 years in the 1980s and 90s combined with mathematical science can make the next 17 years so rich, you’ll always be rich. Or you can have the report free when you subscribe to Pi. Here is a ratio that can make us rich….1.6 to 1. Leverage in this amount has helped build one of the greatest fortunes in history. This ratio is one of three secrets in the science of everlasting wealth. Research published at Yale University’s website shows the actual science of using this ratio to become and remain rich. A research paper shows how Warren Buffett used leverage to amass his $50 billion dollar fortune. The researchers found that the returns from Buffett’s investment company, Berkshire Hathaway, far outweighed those achieved by any rival that has operated for 30 years or more. The research shows that neither luck nor magic are involved. Instead, the paper shows that Buffet’s success hinges on using leverage at this Golden Ratio of 1.6 to make large purchases of “cheap, safe, quality stocks”. Buffett has amassed an amazing fortune by leveraging a good strategy for very long periods of time, surviving rough periods where others might have been forced into a fire sale or a career shift. The study found that Buffett applies a leverage of about 1.6 to 1, boosting both his risk and excess return in that proportion. He uses this in his borrowing, not too little, not too much. The 50 years of experience the Pi course shares also explains when leverage provides extra potential. For example in 1986 I issued a report called The Silver Dip that showed how to borrow 12,000 British pounds (at almost 1.6 to 1 dollars per pound the loan created US$18,600) and use the loan to buy 3835 ounces of silver at around US$4.85 an ounce. Imagine investing in a spike like this… with leverage! Conditions for the silver dip returned 30 years later. The availability of low cost loans and silver were at an all time low. With investors watching global stock markets bounce up and down, many missed two really important profit generating events. I prepared a special report “Silver Dip 2015” about a leveraged silver speculation that can increase the returns in a safe portfolio by as much as eight times. The purpose of the report is to share long term lessons gained through 30 years of speculating and investing in precious metals. While working on the report, when the gold silver ratio slipped to 80 and the price of silver dropped below $14 an ounce, I knew I needed to share this immediately. I released a new report “Silver Dip 2015” so readers could take advantage of these conditions and leverage 1.6 times as a speculation. The speculation was so time sensitive with such fast profit (but also loss) potential that I only offer it for a short time. As explained above, that report helped create a 98.68% profit in just eight months. There is still plenty of potential in the Silver Dip 2016 but a new even bigger opportunity has arrived. A Chinese stock and currency distortion has created a new leverage opportunity. This potential caused me to rush out another report “Safe Speculations in Currency Profits”. This new report shows how there is a sequence that the appreciation or decline of currencies and stock markets always follow. After 50 years of global business and investing, I have learned to watch for aberrations in this sequence. Sometimes a rare quirk, such as we saw with the yen loan and the Silver Dip offers potential for a quick, fast profit, but almost no risk of long term loss. The newest such quirk is a Chinese stock and currency distortion that recently came together. This anomaly has really captured my attention because it offers extra potential for those who act now. Investors who jump in at the correct breaks in the sequence can make fortunes. Success is almost guaranteed. In fact an 89 year study showed a 99% change of success when sequence distortions are worked in a certain way. My new report “Safe Speculations in Currency Profits” shows how to cash in on a distorted cycle in the sequence of China’s stock market and currency that has interfered with the US dollar’s fall. The economic expansion you’ll learn may be one of the most important social, economic phenomena since the original Industrial Revolution two and a half centuries ago. Upon completion the sequence will triple the number of poor who will have been lifted from poverty. This is such a huge change that Chinese growth is not going away because China has discovered a secret economic recipe. This recipe will make those who invest in it rich, maybe overnight, certainly over time. (Supporting China’s economy will help the world be a better place as well). To order the new report “Safe Speculations in Currency Profits” that shows how to gain a special short term opportunity in China and in Britain with little long term risk, $49 click here. Subscribe to the first year of The Personal investing Course (Pi). The annual fee is $299, but to introduce you to this online course that is based on real time investing, I am knocking $102 off the subscription. Plus you receive the $29.95 report “Three Currency Patterns For 50% Profits or More” and the $27 report “The Silver Dip 2016” and $49 report “Safe Speculations in Currency Profits” free for a total savings of $207.95. Enroll in Pi. Get all issues of Pi, and the report “Three Currency Patterns For 50% Profits or More” and “The Silver Dip 2015” and “Safe Speculations in Currency Profits” right away. #2: I guarantee to cancel your subscription and refund your subscription fee in full, no questions asked. #3: I guarantee you can keep “Three Currency Patterns For 50% Profits or More” and “The Silver Dip 2106” and “Safe Speculations in Currency Profits” reports as my thanks for trying. Save $158.95. Subscribe to the Pi for $197.